The National Civil War Museum (Harrisburg, PA) has received a $30,000 grant from the Kunkle-Rutherford Foundation to pay for upgrades to the museum’s galleries audio system. The George Gund Foundation awarded a $150,000 grant to the Western Reserve Historical Society (Cleveland, OH) for the restoration and installation of the Euclid Beach Carousel at its University Circle facility. Thanks to a $2,000 grant from the Wisconsin Humanities Council, the Wisconsin Maritime Museum (Manitowoc, WI) will create four new guides on the Manitowoc River, focusing on a different facet of the river and its heritage. Drumming at the Musical Instrument Museum in Phoenix. Two Affiliates â€“ California Science Center (Los Angeles) and Musical Instrument Museum (Phoenix, AZ) â€“ made the list of USA Todayâ€™s 20 BestÂ Museums for Families across the USA. As part of a marketing campaign planned for this spring, the Nebraska Tourism Commission surveyed Nebraskans and non-Nebraskans alike on what Nebraska attractions and events are the most iconic. The Strategic Air & Space Museum (Ashland, NE) came in at #7 and was the only state museum in the top-10. Peter Aucella, assistant superintendent of Lowell National Historical ParkÂ (Lowell, MA) is the 2014 recipient of the Kiwanis Club of Greater Lowell’s Thomas G. Kelakos Community Spirit Award, which recognizes people who give back to the community. The Abbe MuseumÂ (Bar Harbor, ME) received the 2014 Maine Office of Tourism Leadership and Growth Award. 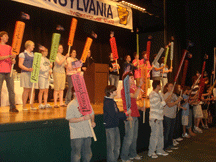 The Army Heritage Center Foundation (Carlisle, PA)Â announced that its education director, Jeff Hawks, will receive the Adler Friend of Education Award from the Pennsylvania State Education Association for his work as state coordinator for National History Day in Pennsylvania. The Building Museums Symposium selected the Museum of History and Industry (Seattle, WA) as one of two museums to be awarded the 2014 Building Museums â€œBuildyâ€ Award in recognition of their exemplary accomplishment in leading their institution through the challenging process of creating new museum space. The museum converted an historic Naval Armory building into museum space, while retaining the architectural integrity of the historic landmark. 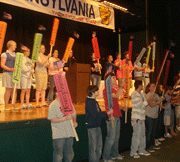 The Antique Automobile Club of America Museum (AACAM in Hershey, PA) was recently awarded five NAMMY awards, bestowed by the National Association of Automobile Museums (NAAM) at their annual conference in CaliforniaÂ last week.Â AACAM took home first place awards for Events & Public Promotion, Collateral Materials, and Interpretative Exhibits; and third place awards for Newsletters and Magazines, and Websites.Â Mark Lizewskie, Executive Director of the AACAM, was also elected to the NAAM Board of Directors. American Art Museum curator E. Carmen Ramos gives a talk on What is Latino About American Art? at the Frost Art Museum. The talk coincides with the opening of the Smithsonianâ€™s traveling exhibition, Our America: The Latino Presence in American Art, in Miami, 4.2. National Postal Museum educator Kim Harrell leads a workshop on designing educational materials at the Museo y Centro de Estudios HumanÃ­sticos in Gurabo, 4.5. The Museum of History and Industry participates in the National Museum of American Historyâ€™s Let’s Do History, a program which supports teachers in using museum objects in their classrooms in Seattle, 4.7. 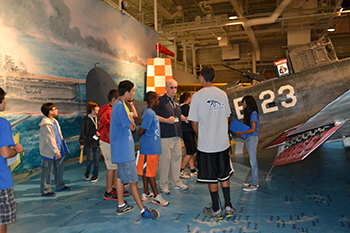 The College Park Aviation Museum welcomes volunteers from the National Postal Museum for a behind-the-scenes tour in College Park, 4.8. Staff from California Science Center (Los Angeles) and the Museum of Flight (Seattle) will join National Air and Space Museumâ€™s Michael Hulslander and NASA educator, Jennifer Kennedy at a session during the Mutual Concerns of Air and Space Museums conference to discuss collaborative possibilities related to space shuttle history, 4.14. The Wankel Tyrannosaurus Rex fossil specimen travels to the National Museum of Natural History from the Museum of the Rockies in Bozeman, 4.15. National Museum of American History curator Dwight Blocker Bowers gives a talk on â€œThatâ€™s Entertainment!â€ at the Fort Worth Museum of Science and History in Fort Worth, 4.17. National Museum of Natural History Director Kirk Johnson gives a lecture on From Fossils to Freeways and Shovel-tuskers to Cornhuskers: Nebraskaâ€™s contribution to the great story of life on Earth at the University of Nebraska State Museum in Lincoln, 4.23. The Virginia Museum of Natural History opens SITESâ€™ Farmers, Warriors, Builders: The Hidden Life of Ants exhibition in Martinsville, 4.26. Loren Schoenberg, Artistic Director of New York City Affiliate, the National Jazz Museum in Harlem, will give a talk on Painting Jazz at the Long Island Museum of American Art, History and Carriages in Stony Brook, 4.27. Young Historians, Living Histories- Today’s Stop: Cleveland, OH! Special thanks to Paula Lee, Smithsonian Affiliations intern, for this guest post. This is the fourth of a five-part blog series she is writing as part of the Young Historians, Living Histories (YHLH)Â collaboration with the Asian Pacific AmericanÂ Center and our Affiliate network. Local Cleveland newspaper ad- how students were recruited! In Cleveland, students began an early session of preliminary interviews because practice after-all makes perfect. Dr. John Grabowski, Senior Vice President of Research and Publications of Western Reserve Historical Center (Cleveland, OH), sought out partnership with local Asian Indian American community, the Asian Indian Heritage Project (AIHP).Â WRHS and AIHP, having had a previous history of partnerships, rekindled their alliance and worked to produce an advertisement that was placed in two local newspapers, India International and The Lotus for recruits based off short essays. 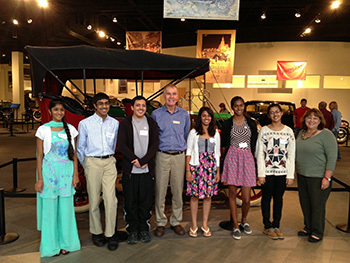 Six highly dedicated and intelligent youth from the Asian Indian community were selected to represent the Northeast Ohio population. Read more about the students’ films at CAAM Fest here. Students were paired and interviewed successful doctors, community leaders (founder of AIHP Mr. Paramijit Singh) and social workers gathering a riveting collection of stories in the duration of their hour-long interviews. 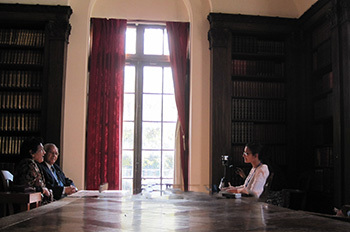 The museum provided its Research Library to create a professional theme for the filming to take place, while interviewees dressed in traditional Indian clothing as a reminder of their culture in the midst of relocation and adaptation in America.Â When they werenâ€™t asking for help editing footage through Dr. Grabowski or Jane Mason, Vice President of Marketing and Communications, students would take the camcorders and complete the editing as home projects.Â Â Each student dove into the project with such passion and enthusiasm, they even gathered at the museum on their own over Thanksgiving break to continue without pause! In a follow up call with Marketing Assistant Alyssa Purvis, I was informed that that the AIHP held a banquet selling raffle tickets to raise funds for the next set of students eager to continue with the project having already received inquiries. â€œThe students are a huge driving force behind the continuation of this project; they keep meeting others within their community and wanting to preserve their stories.â€ Their efforts â€œhave had a ripple effect, on their families and entire Indian community as a whole in Northeast Ohio. Through all those involved in Young Historians, Living Histories, I amongst many others have had a chance to discover how proactive these youth are when it comes to using these community resources. It is amazing to see how well the youth are responding to this form of research and discovery. 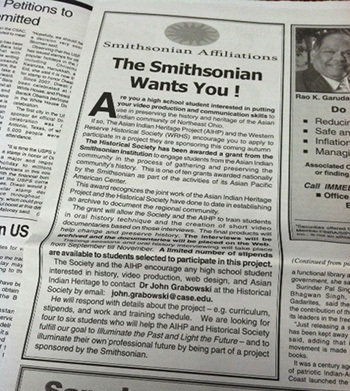 As the Asian Indian Heritage Project mantra goes, we hope our accomplishments â€œIlluminate the Past, Light the Futureâ€! https://affiliations.si.edu/wp-content/uploads/2014/03/wr.6.jpg 232 350 Elizabeth Bugbee https://affiliations.si.edu/wp-content/uploads/2019/03/si_Affiliations_rgb_single-line_color-280w-1.jpg Elizabeth Bugbee2014-03-06 11:24:532017-03-10 17:50:36Young Historians, Living Histories- Today's Stop: Cleveland, OH! Young Historians, Living Histories- Today’s Stop: Honolulu, HI! Special thanks to Paula Lee, Smithsonian Affiliations intern, for this guest post. 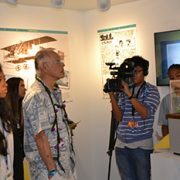 This is the third of a five-part blog series she is writing as part of the Young Historians, Living Histories (YHLH)Â collaboration with the Asian Pacific AmericanÂ Center and our Affiliate network. As we travel west to hear from our Affiliates at Pacific Aviation Museum Pearl Harbor (Honolulu, HI) we take flight almost literally, with those who once navigated overseas when aerial travel was a rare and exciting introduction to history. 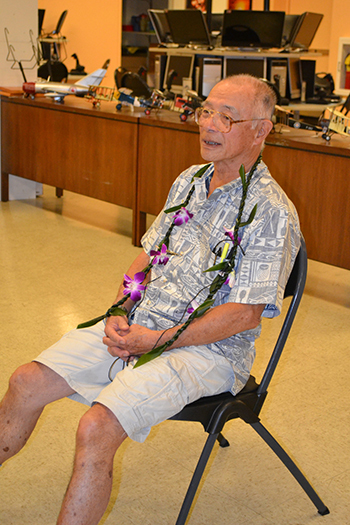 Shauna Tonkin, Director of Education at the Pacific Aviation Museum Pearl Harbor, connects us with Curtis Joe, immediate nephew of Chinese-American aviator and stunt pilot, Tom Gunn and Pan Am Japanese-American flight attendants, Mae Takahashi and Aileen Sodetani. 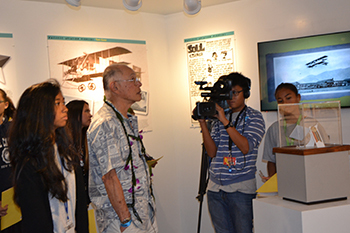 Tonkin partnered with Chris Facuri, Digital Media Teacher at Aliamanu Middle School, enabling the oral histories collected and edited throughout the school year to be incorporated into studentsâ€™ curriculum. 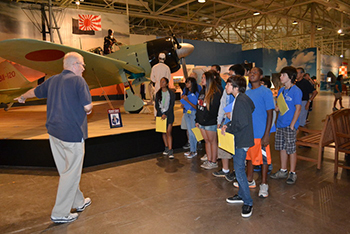 Participating students in the class took a field trip to visit the museum to meet Joe, Sodetani and Takahashi, where the entire group received a historical tour before sitting down for interviews. The two flight attendants live locally in Honolulu while Joe flew out from San Francisco to be a part of this project. All were very appreciative and realized the value of sharing the experiences that theyâ€™ve endured with younger generations. In response, the interactions with the pioneers made the experiences and stories come alive for the students studying them, activating their interests and courage to solicit knowledgeable questions. Ford Island, where the museum is located is in the middle of Pearl Harbor, Honolulu, HI. On December 7, 1941, Japanese aircraft led a surprise attack initiating World War II. This led to a hard time for both Americans and Asian Americans, because the following year over 150,000 Japanese were ordered into internment camps although 62% of them were American citizens. â€œThe program served to be education, dynamic and responsive due to the nature of its interactive learning environmentâ€ observed by cooperating teacher Chris Facuri. Sparking the curiosity and interests of the youth was an important experience for Tonkin as she empathized with the difficulties of 1st generation children and their journey towards finding homage and respect for their culture while adapting to American influence. 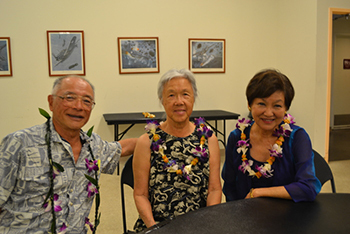 Tonkin emphasizes that this collaboration has â€œinstilled a greater appreciation for diversity and culture of the Asian American Pacific experience. 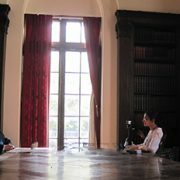 The oral histories collected barely scratched the surface.â€ She said, revealing her excitement towards starting new projects. https://affiliations.si.edu/wp-content/uploads/2014/03/pa.4.jpg 233 350 Elizabeth Bugbee https://affiliations.si.edu/wp-content/uploads/2019/03/si_Affiliations_rgb_single-line_color-280w-1.jpg Elizabeth Bugbee2014-03-04 15:00:352017-03-10 17:50:36Young Historians, Living Histories- Today's Stop: Honolulu, HI!